I visited Paris in June of 2003 for a school trip. While there, I used the metro several times to get around the city. That summer in Paris was particularly hot with some temperatures around 100 F. Consequently, the metro smelled like a mixture of sweat, urine and body odor. One hot day my group and I were walking around Paris observing the buildings when a mob of screaming people suddenly stormed the streets and sidewalks. Many were holding flags and they all were wearing red and white. We learned that they were from Toulouse and were there cheering for their team in the rugby game that day against Paris. Surprised and excited by this demonstration of team spirit, we decided to head to the stadium to see if we could get tickets. The metro was overflowing with people and we had to stuff ourselves in the small compartment with one sweaty body pressed against another. We went to the stadium and found people outside scalping tickets. 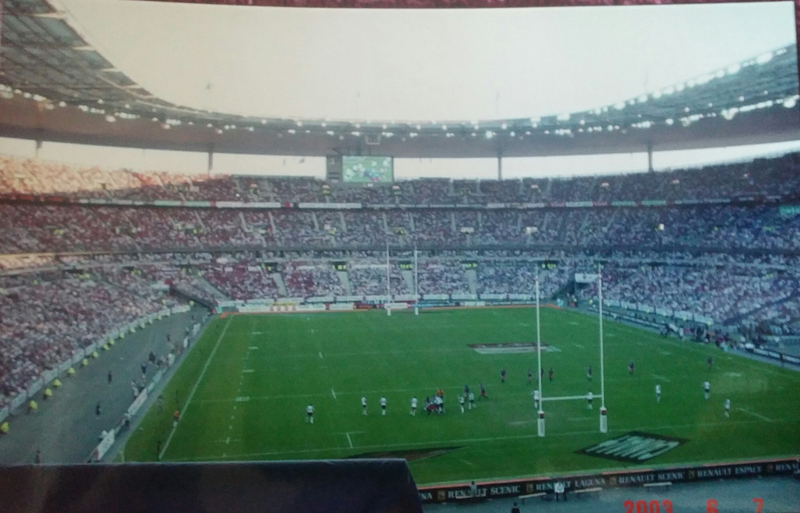 Having no idea what the tickets were really worth, we paid 20 euros each and went inside the stadium. Immediately, we showed our tickets to a person working there and they were kind enough to show us directly to our seats, as we were pretty much clueless on how to go about finding them ourselves. I have never seen rugby before and really didn’t have any idea what was going on in the game. My friend and I glanced at the time clock only to realize that we had no idea how time was kept in a game of rugby. The stadium was huge like a dome, but opened up to the sky at the top. All around us, people were cheering and screaming. At that moment, we knew that we were part of something culturally important, but couldn’t quite grasp onto what that was. It was all very fascinating and engrossing as we observed the crowd and the game. We stayed for a while, then decided we should leave before the game ended, still having no idea when that would be. We found the rest of our group and we all just smiled at each other. This was such an unexpected turn of events that we weren’t quite sure how to react. But it was definitely something we would always remember. 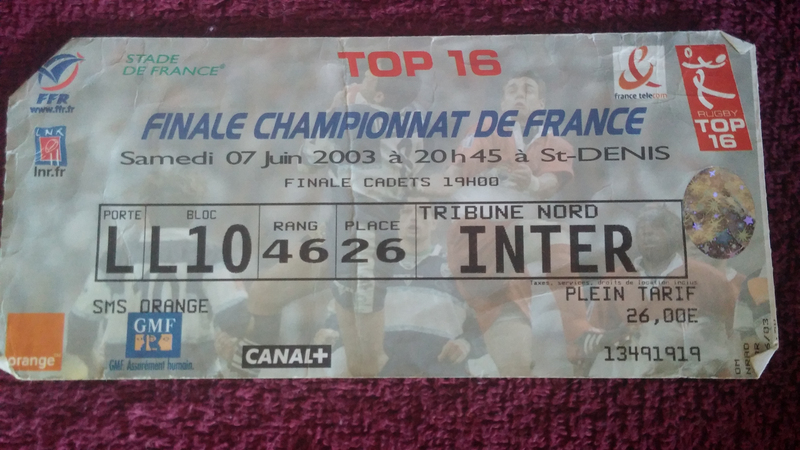 I only spent about three days in Paris, but these are the things that stand out when I remember my time there: the smell of the metro and getting tickets to a rugby game. I also have a funny story about how I got lost on the Eiffel Tower, but I’ll save that for another time. 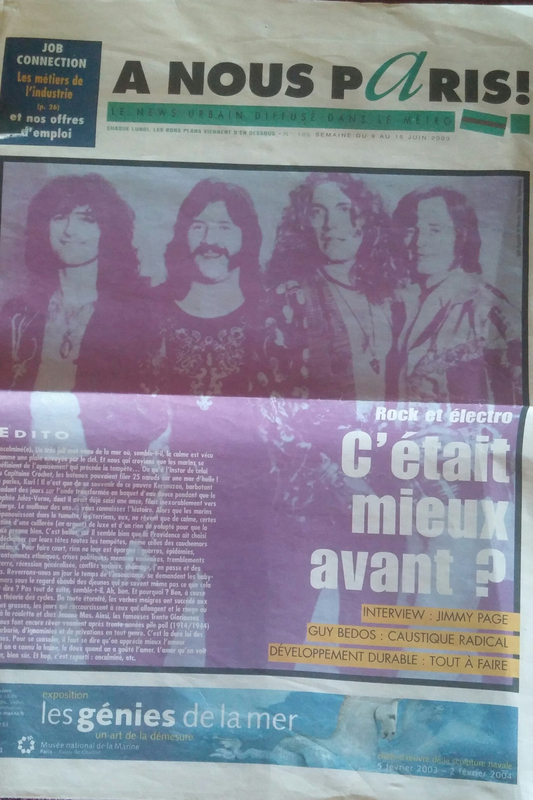 This is the front page of a newspaper I got on my way to the metro in Paris in June of 2003. Rock band, Led Zeppelin, is pictured on the front. Those travel treasures tend to be the ones you “stumble” across 🙂 – thanks for sharing!! !